Two years ago journalist James Vincent wrote an article about being at work in the office from 3,500 miles away. Vincent lives in Britain and he needed to speak to his boss and meet colleagues in the New York office. He managed that via a telepresence. 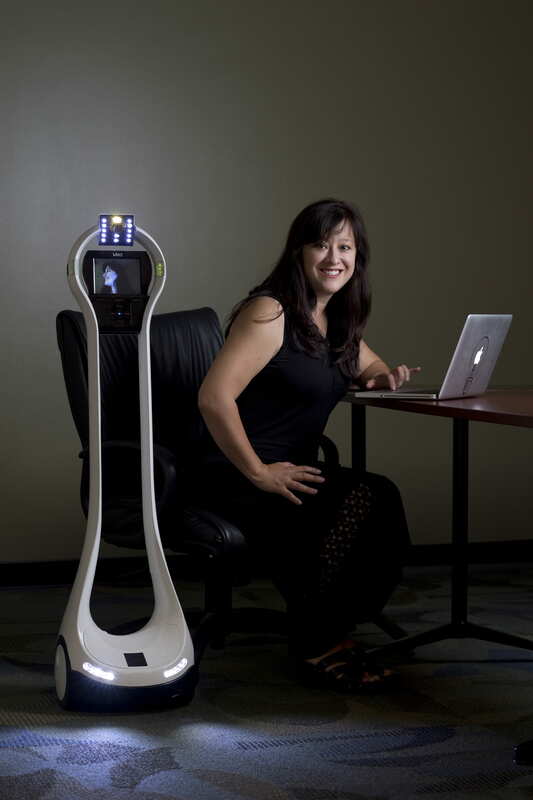 Telepresence robots are screens on wheels that you move around with an app or within a browser. You log in like on Skype and you’re ready to move around the office and talk to colleagues, attend meetings or even lead meetings, all from the comfort of your home. Telepresence robots have been around for a while, and a number of companies use them to manage the presence of colleagues who need to give vital input on ongoing projects, and now their use is being extended from business to making it possible for chronically ill children to attend school. Thousands of children worldwide are unable to attend school due to chronic illness. Apart from falling behind in school work and dealing with the illness itself, children miss out on critical social interaction and experience isolation from their peers and schoolmates. With a telepresence robot it is possible for the child to attend school with friends while being cared for at home. Research has shown that children accept robots easily and interact with them naturally, treating robots as living things and that “physical presence, when combined with movement, enhances the perception of a social link for the operator.” The children at school readily accept the robot as the representative of the sick friend at home. When Maja was three-years-old, she was diagnosed with cancer. Due to treatment and hospital stays, she is absent from school for prolonged periods of time. Recently, her elementary school invested in an AV1. The robot is Maja’s eyes and ears in the classroom on days that she can’t be physically present. Now she participates in class, during break-time, and on field trips – all from her bed. Maja is one of more than 200 children and young adults whose lives the Norway startup Noisolation has enriched with their AV1 telepresence robot. And it’s so cute! See the video below. The robot has a sci-fi look, is small enough to be carried around and is designed to sit on the absent student’s desk where it operates as student’s the eyes and ears. The child operates the robot through an app and can rotate its head to see all around the class. The student signals that they want to speak by instructing the top of the AV1’s head to blink and if they don’t feel like actively participating in class, they let their peers know by turning on the blue light on top of the AV1’s head. AV1 was launched in Norway in September 2016 and is already in use in Norway, Sweden, Denmark, the Netherlands, and the UK.